Halah Al-Hamaydeh is a sincere and diligent person living in San Antonio, Texas. Coming from a large family, she’s naturally social, very driven, hard-working and can accomplish any task given. 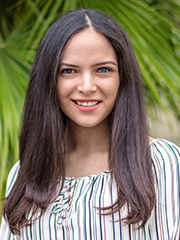 Halah developed her passion for Real Estate after accepting a position as an admin at a Real Estate brokerage in San Antonio. After two years in the field shuffling between admin, assistant, and transaction coordinator, she decided it was time to take everything she’s learned and put it towards getting her Real Estate License. Living in San Antonio for the majority of her life helped provide Halah with the extensive knowledge and experience she has in the area. When she’s not working, you can almost always find Halah at different coffee shops throughout San Antonio or surrounding herself with friends and family.